I know what you're thinking: that Wade bloke has decided not to bother with his surf blog anymore now that it's not on The Times website. Life has been hectic lately. The Wade clan's trip to Hossegor only came to an end last Friday, and then on Saturday Karen and I were busy with the private view of her show at HiltonYoung. Then I had to go to London for a day's worth of boxing. What with living a couple of miles from Land's End, it's taken the best part of the week to get home again. Anyway, life at Surf Nation continues - and will continue somewhere else soon... Can't say more just now but I leave you with news that World Champ Stephanie Gilmore is not only a great surfer but a fine person, too. I interviewed her for Huck magazine while in Hossegor and she was interesting and inspiring, open and generous. Without any prompting she lent my elder son Harry her board while we spoke, and, as you can see, he was stoked. Who is this dude? Well, he's Nick Williams and he's nice and vertical at Fistral Beach, Newquay - his local break. When he's not shredding, he's a fine painter. Indeed, he's just been short-listed for a major UK art award, the Threadneedle Figurative Art Prize. The press release alerting me to this makes for a good read, so - read on. Nicholas Charles Williams (Nick to his friends) is a regular in the line up at Fistral, Newquay where he lives and works. In between surf sessions Nick has developed a career as a painter and this month has been shortlisted for a major art award, the Threadneedle Figurative Art Prize. The award offers two significant prizes with the chance to win a total of £35,000. Nick took up surfing when he was twelve, learning at Harlyn Bay and Constantine on the North coast of Cornwall. He settled in Newquay around 1980 and in his twenties often competed, eventually becoming a surf judge on BSA and Pro/Am events, the highlight being judging the Hot Tuna 1992 ASP event won by Mark Occhilupo. As a painter he should have been making the Grand Tour. Instead, like most surfers, he spent winters travelling to various surf spots including California and Australia. During the winter of ‘86 he made the pilgrimage to Hawaii with director of UKPSA Dave Reed, where they both nearly drowned. When travelling Nick always carried his sketchbook and pursued his painting. For the last twelve years he has used, as his permanent studio, Newquay’s former lifeboat station which overlooks little Fistral and the legendary big wave spot the Cribber. He has exhibited widely, with solo shows at the Russell-Cotes Museum & Art Gallery, Bournemouth; Royal Cornwall Museum, Truro; St Mary's Cathedral, Edinburgh and Liverpool Cathedral for the opening of the European Capital of Culture. In 2001 he was awarded the Hunting Art Prize. On the British art scene he is renowned for direct observational painting, often on a large scale. Less known, however, is the fact that he uses the local people of Newquay as his models. One early work featured Lee Bartlett, (twice British Professional Champion) and another was a portrait of Grishka Roberts (twice European Professional Champion) - the painting was later bought by the distinquished art critic Brian Sewell. Here's a novel take on riding waves courtesy of Dustin Humphrey, with thanks to James Orr. Needless to say, it was just like this at Sennen Cove today. How were these shots created? Who knows. But there's a clue as to what's going on here. During the research for Surf Nation, I found myself in Stromness on the Orkney Islands. In Stromness, one non-hungover afternoon while Al Mackinnon and Jesse Davies took photographs and waited in the van, I popped into Stromness Books and Prints on Graham Place. This is one of the best bookshops I have ever visited, brimful with quality fiction, both mainstream and obscure. Among the latter - for me, anyway - was William Heinesen's The Lost Musicians. I was intrigued by the cover illustration (also by Heinson), and the blurb - describing the book as "one of the most important Scandinavian novels of the 20th century" - helped cement its appeal. Heinesen was born in Torshavn in the Faroe Islands in 1900. He died in 1991, by which time he had established an international reputation as a novelist, poet and artist. I hadn't heard of him until I walked into Stromness Books and Prints, and I wouldn't have even been there if it hadn't been for surfing. But over a year later, I've finally got round to reading The Lost Musicians. It's a wonderful book, by turns comedic and surreal, whose most abiding quality is its humanity. Heinesen seems to have been a man with a profoundly compassionate nature and an extraordinary capability to empathise. I won't say more about The Lost Musicians - other than that it is imbued with the sea from start to finish - but would urge you to check it out yourself. More recently, I received a text message from Alf Alderson. He was in the Faroe Isles and had met the local surfing population. It numbered one person. Crowded line-ups evidently aren't an issue up there in the North Atlantic, but is the surf any good? It must be - sometimes, anyway. I suspect that, rather like the Shetland Isles, the wind blows a hoolie most days of the year, messing up what might otherwise be reasonable point and reef set-ups, but the Faroe Isles must get surf, and might just be a (rather cold) discovery waiting to happen. Alf is just about the only person I know who has ventured to the Faroe Isles, and he's also the author of Surfing: A Beginner's Guide (John Wiley & Sons Ltd, £12.99). 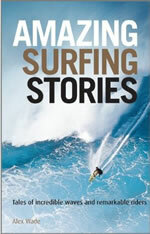 This is just the book for anyone wanting to get into surfing, and while many people who read this blog might not be in need of enlightenment concerning surfing's fundamentals, even a poor August such as we're 'enjoying' currently is a reminder that hordes of people are still taking to the sea to try their hand at surfing. They'd undoubtedly benefit from Alf's book (just reissued in an updated second edition), which is a fine combination of authoritative explication and practical know-how. There are useful tips on kit maintenance and ding repair, a mini-guide to some of the better known of the world's surf spots, and a section on surfing manoeuvres. It's good stuff from start to finish, just right for anyone getting into the sport. It'd be nice to see it on sale in the Faroe Isles, next to a copy of Heinesen's Lost Musicians. And it'd be nice to check out the surf up there. Anyone for a trip to the Faroes? Images, from PhotoTravels.net, courtesy of Frantisek Staud. Meanwhile, here's hoping the swell and wind settle down for the Paddle for Relief event at Croyde and Saunton this weekend. See www.paddle4relief.co.uk for more info. The picture is by Russ and shows what the Cove has been likely lately. Following his exploits on Sunday at Sennen Cove, young Harry Wade has been signed up to Team SurfTwisted. He surfed well yesterday, too, with the swell still sizeable, though his Dad was right off the pace and couldn't get his act together. At this rate, Harry will refuse to paddle out with me soon, let alone have me next to him in the line-up, so I'd better make an effort pretty damn soon. On a (slightly) more serious note, the last two days have reminded me of how integral confidence is to surfing. By my (low to middling) standards, I've been surfing well lately, and then, bang - the biggest swell we've had for months turns up. Just a couple of months ago, Harry probably wouldn't have gone out in it, but he went and charged; by contrast, although I like chunky surf, these past couple of days I've found myself not committing on take-offs and generally making mistakes. There's no danger of a lucrative free-tea-in-Newquay deal with SurfTwisted for me, that's for sure. Meanwhile, why should lawyers surf? Having been one, I'd say that the answer is that if they don't, when they finally return to live once again by the coast they'll be condemned to languish forever in the intermediate zone, sometimes getting it right, sometimes getting it wrong. But Tim Kevan, author of a book cunningly entitled Why Lawyers Should Surf, begs to differ. He's quit briefs in the City for clean lines at Lynemouth, and his book is reviewed below by Tom Anderson, a Welshman who had many scrapes with the lawyers (not least, a night out with me which we somehow both survived) but never became one. Instead he leapt straight to being a writer and surfer, penning the much-acclaimed Riding the Magic Carpet. I'm not jealous, honest, so without further ado, here's Tom review. From the days of the Hawaiian kings to the present, surfing has always captured people's imagination and managed to take them out of their day to day lives. It is uplifting and spiritual and provides a connection with nature and forces greater than ourselves. So it seems only natural when the authors point to surfing as a way of helping cope with the stresses of modern living and of re-gaining some balance in life. Why Lawyers Should Surf is written by a former barrister and a psychiatrist. I particularly liked the way they avoided the cheesy, self-satisfied tone that instantly puts me off most motivational books, which too often come across as some sort of instruction booklet for life but which forget the art and lose sight of the soul. This book on the other hand not only provides an extremely clear and accessible introduction to cutting-edge techniques for getting one's mind into shape but it also provides a context. It stresses the need to feed the soul and listen to your own heart just as surfers monitor the movements of the ocean. The use of the metaphor of surfing works surprisingly well. It not only taps into the inherent power of the sea but also has the benefit of resonating with those who have perhaps previously only ever surfed the internet. What's more, the book subtly introduces the reader to a wide mix of literary, scientific and spiritual sources. As a surfer I particularly liked the enormous range of the quotations and reflections on the meaning of surfing itself and our almost primeval connection with the sea. (In many ways it is a song for the modern age which could well become a cult classic like perhaps Anne Morrow Lindbergh's Gift from the Sea. As for the reference to lawyers, it is clear that they are simply being used as an example of the work-shackled majority who perhaps yearn for something more in their lives. Certainly it applies across the board to anyone looking for inspiration. The tone throughout is authentic and a nice footnote is that since co-writing the book Tim Kevan has indeed walked the talk and given up the trappings of the bar for the surf of North Devon. He is now living in Braunton and writing a novel for Bloomsbury Publishing. That's what I'm talking about! Spot on for surfers, lawyers and anyone else looking for inspiration. The picture of SurfTwisted's Harry 'Wiggoly' Wade, someone showing no sign of becoming a lawyer, is by Greg Martin. For the first time in years, I failed to make it to the Rip Curl Boardmasters. I wish I'd managed to escape work and commitments here in the far west, because by all accounts the event was excellent.This year's Boardmasters winner is the intriguingly named Brazilian surfer Wiggoly Dantas, who claimed his maiden ASP World Qualifying Series title in testing four to six foot waves at Fistral Beach after defeating fellow Brazilian Pablo Paulino (BRA). Meanwhile, here on the far western front the surf was onshore and messy but big. I often think that Sennen Cove holds onshore swell better than most places and yesterday there were some seriously large sets in the middle of the beach. A highly enjoyable and late Saturday night meant that I was in a somewhat delicate condition when I paddled out at around 4.30pm (yes, it was a big night), and if truth be told I didn't have a particularly good surf. The set waves were easily double-overhead on the face and I felt a little too out of sorts to commit to them. I had one reasonable wave, one nailing, and then a mauling when caught inside, and that was about it. But yesterday was a watershed day in my son Harry's surfing life. He's only just turned 13 but put in a real charging performance. This isn't just paternal pride talking. James Parry paddled past at one point with a big grin on his face, having just seen Harry make the drop on a set wave, and said "He's charging!" Dave Muir and the other instructors from the Sennen Surfing Centre were stoked to see Harry surf as he did, and I think pretty much everyone out there felt the same. He wasn't the best surfer in the line-up, but along with James Parry he took the biggest waves, again and again. As I say, the surf was big - and this is a 13-year-old we're talking about. It was great to see and afterwards Harry was ecstatic. As we are wont to do, we watched old surf movies until late (Free Ride is a favourite at the moment), and talked over the session. Harry paid tribute to Dave Muir and the instructors from the Sennen surf cadets, saying that if they hadn't been out there shouting him into waves, he might not have gone for them. I went to bed thinking that Harry's life is heading in one clear direction now. It's one that I'll encourage as much as possible. It also struck me that yesterday, Harry moved away - just a little - from his Dad. He took, at just 13, a major step towards becoming a young man. Knowing this, and watching him surf, made me feel immensely proud - and ever so slightly melancholy, too. Nice to hear from Zed Layson, who has just scored Pavones in Costa Rica looking decidedly better than PK yesterday afternoon (Alf, it really is rubbish!). Here are some shots to whet your appetite. I surfed my local break this afternoon and, as ever, it proved to be as fickle as a Chelsea fan. Three good waves came my way in two hours, the amount of water moving around was ridiculous and nine out of ten waves were close-outs. Up the upside, for most of the session I was the only surfer in the line-up. There was a longboarder out for a while but he disappeared soonish. The set waves were head high and normally the place would be almost-busy, but peak season had made it all but impossible to access the beach for anyone other than locals and the 500,000 tourists who descended on this, the first sunny, dry day for ages. Mercifully, none of those who came, paid and parked was a surfer, and, as I've previously noted here, I'm one of about five local surfers. One of the others is my elder son, Harry, and he was at Sennen; where the others were I don't know. So despite the typically hit-and-miss session which comes with the view at this location, it was a pleasure to have the place to myself (I hope that doesn't sound too selfish). Post-surf, I lamented with Hannah May, one of the lifeguards (pictured, at Another Beach), the way in which PK flatters only to deceive. There have been magazine shots of this place and it's in the guide books, but the reality, for anyone who knows it even vaguely well, is that it's a mostly rubbish wave in an always stunning location. Hannah nodded sagely and then told me that she'd earlier been confronted by a tourist who, with his young son, had approached her and said: "Now then, is that a woman?" Hannah had been a little discomforted by this opening gambit but, not unreasonably, the young lad had said "Yes." To which, his father said: "You see, I told you lifeguards can be women." Meanwhile, the sun shone, having no alternative, on the nothing new: another perfect set rolling in from the horizon, only to break in the most unfathomable fashion.